Ruby Sky putting her baby hands to work! I can't believe this was last November already... does not seem like so long ago. I created my own block of patterned paper on watercolour paper by dipping the water soluble artist crayon directly into water and drawing on the paper. For small details, like the tiny dots, I used a fine tip watercolour brush loaded with water, picked up pigment from the artist crayon with the brush, and then painted on the paper with it. To create drips and splatters on the page, I loaded a hard bristled brush for acrylic paint with water and picked up pigment directly from the crayon. I used my fingers to squeeze drips of solubilized crayon pigment onto the completed layout, and passed the brush bristles over the edge of the crayon to create a fine splatter. I made this patterned paper using artist's crayons and a piece of watercolour paper. 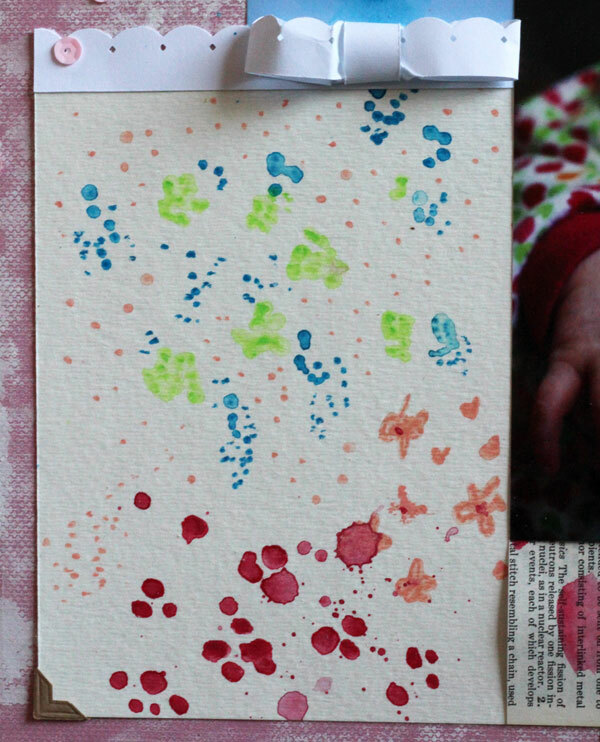 To create the small green, blue, and light pink dots, I used a fine watercolour brush loaded with water. I picked up pigment from the crayon by touching the wet brush directly to the crayon. Then I dabbed small dots of paint. To create lighter dots, I picked up a tiny bit of water to freshen the brush, and went back to painting without adding more pigment to the brush. 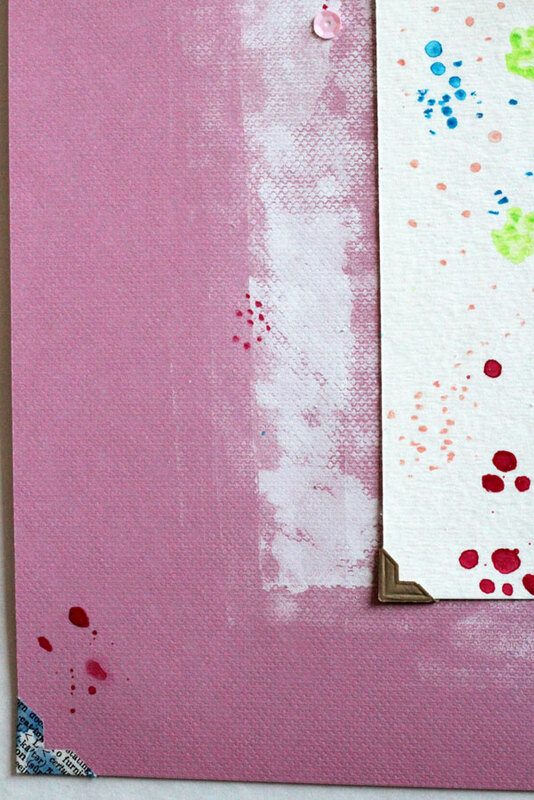 The large, darker pink splats were made by dipping the crayon tip directly into water and then gently holding the wet crayon point to the paper. The solubilized crayon pigment ran down the tip onto the paper. I added splashes by holding the wet crayon up off the paper so the drip fell down onto the paper. I loaded crayon onto a piece of scrap paper, loaded a wet brush with wet crayon, and then painted this little smear. This was actually a scrap paper I was just testing the crayon colour out on, but I liked the way it looked so it ended up on the layout. 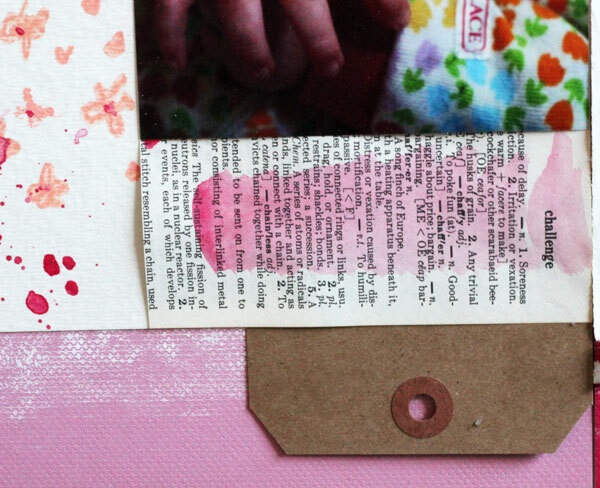 The white textured background on the cardstock was made by loading a brayer with gesso, and then rolling the brayer on the cardstock. I repeated this until I had sufficient coverage. 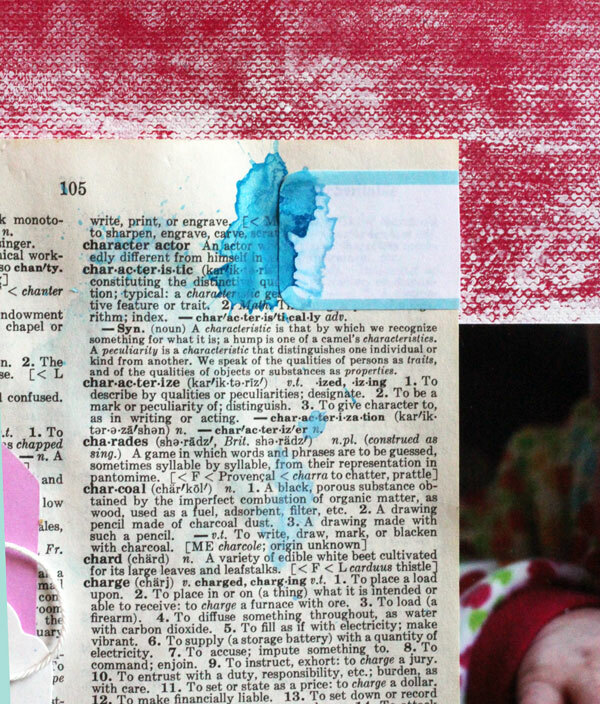 The blue splatters are also artist crayon -- I wet the crayon and used a paint brush to force wet crayon pigment to fall onto the dictionary page and label. I coloured a bit on some dictionary page before punching out the photo corners. 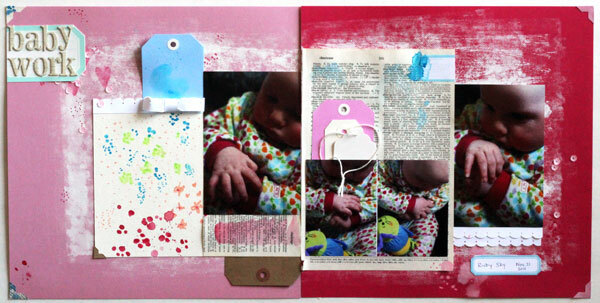 More crayon splats and brayered gesso on this layout corner, too. TFS - This is a great little Memory Book!